This will launch a browser, asking you to authenticate with either your GitHub or Microsoft account. Once authenticated, it will create a CodePush account “linked” to your GitHub/MSA identity, and generate an access key you can copy/paste into the CLI in order to login. Note: After registering, you are automatically logged-in with the CLI, so until you explicitly log out, you don’t need to login again from the same machine. Note: In order to link multiple accounts, the email address associated with each provider must match. This will launch a browser, asking you to authenticate with either your GitHub or Microsoft account. This will generate an access key that you need to copy/paste into the CLI (it will prompt you for it). You are now successfully authenticated and can safely close your browser window. If you forget to logout from a machine you’d prefer not to leave a running session on (e.g. your friend’s laptop), you can use the following commands to list and remove any current login sessions. code-push access-key add "VSTS Integration"
For security, the key will only be shown once on creation, so remember to save it somewhere if needed! After creating the new key, you can specify its value using the --accessKey flag of the login command, which allows you to perform “headless” authentication, as opposed to launching a browser. When logging in via this method, the access key will not be automatically invalidated on logout, and can be used in future sessions until it is explicitly removed from the CodePush server. However, it is still recommended that you log out once your session is complete, in order to remove your credentials from disk. Once you’ve logged in, any inferred and/or specified proxy settings are persisted along with your user session. This allows you to continue using the CodePush CLI without needing to re-authenticate or re-specify your preferred proxy. If at any time you want to start or stop using a proxy, simply logout, and then log back in with the newly desired settings. Additionally, if at any time you want to see what proxy settings (if any) are being used for your current login setting, simply run the code-push whoami command, which will display whether you’re using, or explicitly bypassing a proxy. NOTE: Using the same app for iOS and Android may cause installation exceptions because the CodePush update package produced for iOS will have different content from the update produced for Android. All new apps automatically come with two deployments (Staging and Production) so that you can begin distributing updates to multiple channels without needing to do anything extra (see deployment instructions below). After you create an app, the CLI will output the deployment keys for the Staging and Production deployments, which you can begin using to configure your mobile clients via their respective SDKs (details for Cordova and React Native). The app’s name is only meant to be recognizable from the management side, and therefore, you can feel free to rename it as necessary. It won’t actually impact the running app, since update queries are made via deployment keys. Do this with caution since any apps that have been configured to use it will obviously stop receiving updates. NOTE: This expects the developer to have already registered with CodePush using the specified e-mail address, so ensure that they have done that before attempting to share the app with them. NOTE: A developer can remove him/herself as a collaborator from an app that was shared with them. From the CodePush perspective, an app is simply a named grouping for one or more things called “deployments”. While the app represents a conceptual “namespace” or “scope” for a platform-specific version of an app (e.g. 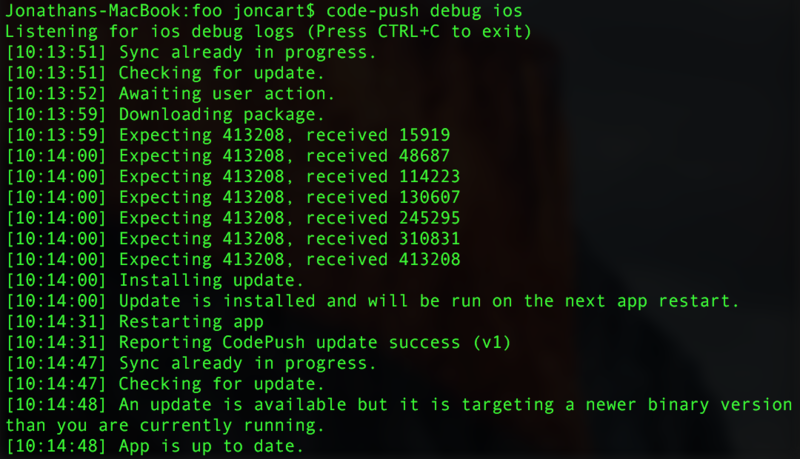 the iOS port of Foo app), its deployments represent the actual target for releasing updates (for developers) and synchronizing updates (for end-users). Deployments allow you to have multiple “environments” for each app in-flight at any given time, and help model the reality that apps typically move from a dev’s personal environment to a testing/QA/staging environment, before finally making their way into production. NOTE: As you’ll see below, the release, promote and rollback commands require both an app name and a deployment name is order to work, because it is the combination of the two that uniquely identifies a point of distribution (e.g. I want to release an update of my iOS app to my beta testers). 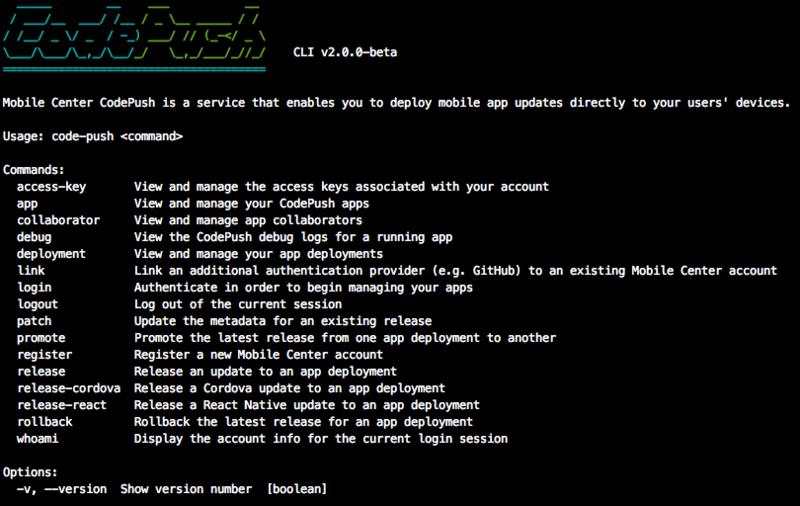 Whenever an app is registered with the CodePush service, it includes two deployments by default: Staging and Production. This allows you to immediately begin releasing updates to an internal environment, where you can thoroughly test each update before pushing them out to your end-users. This workflow is critical for ensuring your releases are ready for mass-consumption, and is a practice that has been established in the web for a long time. NOTE: Due to their infrequent use and needed screen real estate, deployment keys aren’t displayed by default. If you need to view them, simply make sure to pass the -k flag to the deployment ls command. Active - The number of successful installs that are currently running this release (i.e. if the user opened your app, they would see/run this version). This number will increase and decrease as end-users upgrade to and away from this release, respectively. This metric shows both the total of active users, as well as what percentage of your overall audience that represents. This makes it easy to determine the distribution of updates that your users are currently running, as well as answer questions such as “How many of my users have received my latest update?”. Total - The total number of successful installations that this update has received overall. This number only ever increases as new users/devices install it, and therefore, this is always a superset of the total active count. An update is considered successful once notifyApplicationReady (or sync) is called after it was installed. Between the moment that an update is downloaded, and it is marked as being successful, it will be reported as a “pending” update (see below for details). Pending - The number of times this release has been downloaded, but not yet installed (i.e. the app was restarted to apply the changes). Therefore, this metric increases as updates are downloaded, and decreases as those corresponding downloaded updates are installed. This metric primarily applies to updates that aren’t configured to install immediately, and helps provide the broader picture of release adoption for apps that rely on app resume and/or restart to apply an update (e.g. I want to rollback an update and I’m curious if anyone has downloaded it yet). If you’ve configured updates to install immediately, and are still seeing pending updates being reported, then it’s likely that you’re not calling notifyApplicationReady (or sync) on app start, which is the method that initiates sending install reports and marks installed updates as being considered successful. Rollbacks - The number of times that this release has been automatically rolled back on the client. Ideally this number should be zero, and in that case, this metric isn’t even shown. However, if you released an update that includes a crash as part of the installation process, the CodePush plugin will roll the end-user back to the previous release, and report that issue back to the server. This allows your end-users to remain unblocked in the event of broken releases, and by being able to see this telemetry in the CLI, you can identify erroneous releases and respond to them by rolling it back on the server. Rollout - Indicates the percentage of users that are eligible to receive this update. This property will only be displayed for releases that represent an “active” rollout, and therefore, have a rollout percentage that is less than 100%. Additionally, since a deployment can only have one active rollout at any given time, this label would only be present on the latest release within a deployment. Disabled - Indicates whether the release has been marked as disabled or not, and therefore, is downloadable by end users. This property will only be displayed for releases that are actually disabled. When the metrics cell reports No installs recorded, that indicates that the server hasn’t seen any activity for this release. This could either be because it precluded the plugin versions that included telemetry support, or no end-users have synchronized with the CodePush server yet. As soon as an install happens, you will begin to see metrics populate in the CLI for the release. General - Releases an update to the CodePush server that was generated by an external tool or build script (e.g. a Gulp task, the react-native bundle command). This provides the most flexibility in terms of fitting into existing workflows, since it strictly deals with CodePush-specific step, and leaves the app-specific compilation process to you. React Native - Performs the same functionality as the general release command, but also handles the task of generating the updated app contents for you (JS bundle and assets), instead of requiring you to run both react-native bundle and then code-push release. Cordova - Performs the same functionality as the general release command, but also handles the task of preparing the app update for you, instead of requiring you to run both cordova prepare (or phonegap prepare) and then code-push release. Which of these commands you should use is mostly a matter of requirements and/or preference. However, we generally recommend using the relevant platform-specific command to start (since it greatly simplifies the experience), and then leverage the general-purpose release command if/when greater control is needed. NOTE: Only the 50 most recent releases in a deployment can be discovered and downloaded by the clients. This specifies the name of the CodePush app that this update is being released for. This value corresponds to the friendly name that you specified when originally calling code-push app add (e.g. “MyApp-Android”). If you need to look it up, you can run the code-push app ls command to see your list of apps. This specifies the location of the updated app code and assets you want to release. You can provide either a single file (e.g. a JS bundle for a React Native app), or a path to a directory (e.g. the /platforms/ios/www folder for a Cordova app). Note that you don’t need to ZIP up multiple files or directories in order to deploy those changes, since the CLI will automatically ZIP them for you. If a user is running an older binary version, it’s possible that there are breaking changes in the CodePush update that wouldn’t be compatible with what they’re running. If a user is running a newer binary version, then it’s presumed that what they are running is newer (and potentially incompatible) with the CodePush update. NOTE: If your semver expression starts with a special shell character or operator such as >, ^, or * , the command may not execute correctly if you do not wrap the value in quotes as the shell will not supply the right values to our CLI process. Therefore, it is best to wrap your targetBinaryVersion parameter in double quotes when calling the release command, e.g. code-push release MyApp-iOS updateContents ">1.2.3". NOTE: If the app store version in the metadata files are missing a patch version, e.g. 2.0, it will be treated as having a patch version of 0, i.e. 2.0 -> 2.0.0. This specifies which deployment you want to release the update to. This defaults to Staging, but when you’re ready to deploy to Production, or one of your own custom deployments, just explicitly set this argument. NOTE: The parameter can be set using either “–deploymentName” or “-d”. This provides an optional “change log” for the deployment. The value is simply round tripped to the client so that when the update is detected, your app can choose to display it to the end-user (e.g. via a “What’s new?” dialog). This string accepts control characters such as \n and \t so that you can include whitespace formatting within your descriptions for improved readability. This specifies whether an update should be downloadable by end users or not. If left unspecified, the update will not be disabled (i.e. users will download it the moment your app calls sync). This parameter can be valuable if you want to release an update that isn’t immediately available, until you expicitly patch it when you want end users to be able to download it (e.g. an announcement blog post went live). This specifies whether the update should be considered mandatory or not (e.g. it includes a critical security fix). This attribute is simply round tripped to the client, who can then decide if and how they would like to enforce it. NOTE: This parameter is simply a “flag”, and therefore, its absence indicates that the release is optional, and its presence indicates that it’s mandatory. You can provide a value to it (e.g. --mandatory true), however, simply specifying --mandatory is sufficient for marking a release as mandatory. If an end-user is currently running v1, and they query the server for an update, it will respond with v3 (since that is the latest), but it will dynamically convert the release to mandatory, since a mandatory update was released in between. This behavior is important since the code contained in v3 is incremental to that included in v2, and therefore, whatever made v2 mandatory, continues to make v3 mandatory for anyone that didn’t already acquire v2. If an end-user is currently running v2, and they query the server for an update, it will respond with v3, but leave the release as optional. This is because they already received the mandatory update, and therefore, there isn’t a need to modify the policy of v3. This behavior is why we say that the server will “dynamically convert” the mandatory flag, because as far as the release goes, its mandatory attribute will always be stored using the value you specified when releasing it. It is only changed on-the-fly as necessary when responding to an update check from an end-user. If you never release an update that is marked as mandatory, then the above behavior doesn’t apply to you, since the server will never change an optional release to mandatory unless there were intermingled mandatory updates as illustrated above. Additionally, if a release is marked as mandatory, it will never be converted to optional, since that wouldn’t make any sense. The server will only change an optional release to mandatory in order to respect the semantics described above. This specifies that if the update is identical to the latest release on the deployment, the CLI should generate a warning instead of an error. This is useful for continuous integration scenarios where it is expected that small modifications may trigger releases where no production code has changed. IMPORTANT: In order for this parameter to actually take affect, your end users need to be running version 1.6.0-beta+ (for Cordova) or 1.9.0-beta+ (for React Native) of the CodePush plugin. If you release an update that specifies a rollout property, no end user running an older version of the Cordova or React Native plugins will be eligible for the update. Therefore, until you have adopted the neccessary version of the platform-specific CodePush plugin (as previously mentioned), we would advise not setting a rollout value on your releases, since no one would end up receiving it. This specifies the percentage of users (as an integer between 1 and 100) that should be eligible to receive this update. It can be helpful if you want to “flight” new releases with a portion of your audience (e.g. 25%), and get feedback and/or watch for exceptions/crashes, before making it broadly available for everyone. If this parameter isn’t set, it is set to 100%, and therefore, you only need to set it if you want to actually limit how many users will receive it. You cannot release a new update to a deployment whose latest release is an “active” rollout (i.e. its rollout property is non-null). The rollout needs to be “completed” (i.e. setting the rollout property to 100) before you can release further updates to the deployment. Unlike the mandatory and description fields, when you promote a release from one deployment to another, it will not propagate the rollout property, and therefore, if you want the new release (in the target deployment) to have a rollout value, you need to explicitly set it when you call the promote command. Running the react-native bundle command in order to generate the update contents (JS bundle and assets) that will be released to the CodePush server. It uses sensible defaults as much as possible (e.g. creating a non-dev build, assuming an iOS entry file is named index.ios.js), but also exposes the relevant react-native bundle parameters to enable flexibility (e.g. --sourcemapOutput). Inferring the targetBinaryVersion of this release by using the version name that is specified in your project’s Info.plist (for iOS) and build.gradle (for Android) files. NOTE: We believe that the release-react command should be valuable for most React Native developers, so if you’re finding that it isn’t flexible enough or missing a key feature, please don’t hesistate to let us know, so that we can improve it! This is the same parameter as the one described in the above section. This specifies which platform the current update is targeting, and can be either android, ios or windows (case-insensitive). This value is only used to determine how to properly bundle your update contents and isn’t actually sent to the server. This is the same parameter as the one described in the above section. If left unspecified, the release will be made available to all users. This is the same parameter as the one described in the above section. If left unspecified, this defaults to targeting the exact version specified in the app’s Info.plist (for iOS) and build.gradle (for Android) files. This specifies the file name that should be used for the generated JS bundle. If left unspecified, the standard bundle name will be used for the specified platform: main.jsbundle (iOS), index.android.bundle (Android) and index.windows.bundle (Windows). This specifies whether to generate a unminified, development JS bundle. If left unspecified, this defaults to false where warnings are disabled and the bundle is minified. This specifies the relative path to the build.gradle file that the CLI should use when attempting to auto-detect the target binary version for the release. This parameter is only meant for advanced scenarios, since the CLI will automatically be able to find your build.grade file in “standard” React Native projects. However, if your gradle file is located in an arbitrary location, that the CLI can’t discover, then using this parameter allows you to continue releasing CodePush updates, without needing to explicitly set the --targetBinaryVersion parameter. Since build.gradle is a required file name, specifying the path to the containing folder or the full path to the file itself will both achieve the same effect. code-push release-react MyApp-Android android -p "./foo/bar/"
code-push release-react MyApp-Android android -p "./foo/bar/build.gradle"
This specifies the relative path to the Info.plist file that the CLI should use when attempting to auto-detect the target binary version for the release. This parameter is only meant for advanced scenarios, since the CLI will automatically be able to find your Info.plist file in “standard” React Native projects, and you can use the --plistFilePrefix parameter in order to support per-environment plist files (e.g. STAGING-Info.plist). However, if your plist is located in an arbitrary location, that the CLI can’t discover, then using this parameter allows you to continue releasing CodePush updates, without needing to explicitly set the --targetBinaryVersion parameter. code-push release-react MyApp-iOS ios -p "./foo/bar/MyFile.plist"
This specifies the file name prefix of the Info.plist file that that CLI should use when attempting to auto-detect the target binary version for the release. This can be useful if you’ve created per-environment plist files (e.g. DEV-Info.plist, STAGING-Info.plist), and you want to be able to release CodePush updates without needing to explicity set the --targetBinaryVersion parameter. By specifying a --plistFilePrefx, the CLI will look for a file named <prefix>-Info.plist, instead of simply Info.plist (which is the default behavior), in the following locations: ./ios and ./ios/<appName>. If your plist file isn’t located in either of those directories (e.g. your app is a native iOS app with embedded RN views), or uses an entirely different file naming convention, then consider using the --plistFile parameter. # app version within the STAGING-Info.plist file in either the ./ios or ./ios/<APP> directories. code-push release-react MyApp-iOS ios --pre "STAGING"
# Tell the CLI to use your dev plist (`DEV-Info.plist`). # Note that the hyphen separator can be explicitly stated. code-push release-react MyApp-iOS ios --pre "DEV-"
This specifies the relative path to where the generated JS bundle’s sourcemap file should be written. If left unspecified, sourcemaps will not be generated. Running the cordova prepare (or phonegap prepare) command in order to generate the update contents (www folder) that will be released to the CodePush server. Inferring the targetBinaryVersion of this release by using the version name that is specified in your project’s config.xml file. NOTE: We believe that the release-cordova command should be valuable for most Cordova developers, so if you’re finding that it isn’t flexible enough or missing a key feature, please don’t hesistate to let us know, so that we can improve it. This specifies which platform the current update is targeting, and can be either ios or android (case-insensitive). This is the same parameter as the one described in the above section. If left unspecified, the command defaults to targeting only the specified version in the project’s metadata (Info.plist if this update is for iOS clients, and build.gradle for Android clients). Specifies whether you want to run cordova build instead of cordova prepare (which is the default behavior), when generating your updated web assets. This is valuable if your project includes before and/or after build hooks (e.g. to transpile TypeScript), and therefore, having CodePush simply run cordova prepare isn’t sufficient to create and release an update. If left unspecified, this defaults to false. # instace of the iOS simulator. # Android emulator or attached device. Under the covers, this command simply automates the usage of the iOS system logs and ADB logcat, but provides a platform-agnostic, filtered view of all logs coming from the CodePush plugin, for both Cordova or React Native. This way, you don’t need to learn and/or use another tool simply to be able to answer basic questions about how CodePush is behaving. NOTE: The debug command supports both emulators and devices for Android, but currently only supports listening to logs from the iOS simulator. We hope to add device support soon. NOTE: This command doesn’t allow modifying the actual update contents of a release (e.g. www folder of a Cordova app). If you need to respond to a release that has been identified as being broken, you should use the rollback command to immediately roll it back, and then if necessary, release a new update with the approrpriate fix when it is available. Aside from the appName and deploymentName, all parameters are optional, and therefore, you can use this command to update just a single attribute or all of them at once. Calling the patch command without specifying any attribute flag will result in a no-op. Indicates which release (e.g. v23) you want to update within the specified deployment. If ommitted, the requested changes will be applied to the latest release in the specified deployment. In order to look up the label for the release you want to update, you can run the code-push deployment history command and refer to the Label column. This is the same parameter as the one described in the above section, and simply allows you to update whether the release should be considered mandatory or not. Note that --mandatory and --mandatory true are equivalent, but the absence of this flag is not equivalent to --mandatory false. Therefore, if the parameter is ommitted, no change will be made to the value of the target release’s mandatory property. You need to set this to --mandatory false to explicitly make a release optional. This is the same parameter as the one described in the above section, and simply allows you to update the description associated with the release (e.g. you made a typo when releasing, or you forgot to add a description at all). If this parameter is ommitted, no change will be made to the value of the target release’s description property. This is the same parameter as the one described in the above section, and simply allows you to update whether the release should be disabled or not. Note that --disabled and --disabled true are equivalent, but the absence of this flag is not equivalent to --disabled false. Therefore, if the paremeter is ommitted, no change will be made to the value of the target release’s disabled property. You need to set this to --disabled false to explicity make a release acquirable if it was previously disabled. This is the same parameter as the one described in the above section, and simply allows you to increase the rollout percentage of the target release. This parameter can only be set to an integer whose value is greater than the current rollout value. Additionally, if you want to “complete” the rollout, and therefore, make the release available to everyone, you can simply set this parameter to --rollout 100. If this parameter is ommitted, no change will be made to the value of the target release’s rollout parameter. Additionally, as mentioned above, when you release an update without a rollout value, it is treated equivalently to setting the rollout to 100. Therefore, if you released an update without a rollout, you cannot change the rollout property of it via the patch command since that would be considered lowering the rollout percentage. This is the same parameter as the one described in the above section, and simply allows you to update the semver range that indicates which binary version(s) a release is compatible with. This can be useful if you made a mistake when originally releasing an update (e.g. you specified 1.0.0 but meant 1.1.0) or you want to increase or decrease the version range that a release supports (e.g. you discovered that a release doesn’t work with 1.1.2 after all). If this paremeter is ommitted, no change will be made to the value of the target release’s version property. code-push patch MyApp-iOS Staging -t "1.0.0 - 1.0.5"
It’s quicker, since you don’t need to reassemble the release assets you want to publish or remember the description/app store version that are associated with the source deployment’s release. It’s less error-prone, since the promote operation ensures that the exact thing that you already tested in the source deployment (e.g. Staging) will become active in the destination deployment (e.g. Production). We recommend that all users take advantage of the automatically created Staging and Production environments, and do all releases directly to Staging, and then perform a promote from Staging to Production after performing the appropriate testing. This is the same parameter as the one described in the above section, and simply allows you to override the description that will be used for the promoted release. If unspecified, the new release will inherit the description from the release being promoted. This is the same parameter as the one described in the above section, and simply allows you to override the value of the disabled flag that will be used for the promoted release. If unspecified, the new release will inherit the disabled property from the release being promoted. This is the same parameter as the one described in the above section, and simply allows you to override the mandatory flag that will be used for the promoted release. If unspecified, the new release will inherit the mandatory property from the release being promoted. This is the same parameter as the one described in the above section, and allows you to specify whether the newly created release should only be made available to a portion of your users. Unlike the other release metadata parameters (e.g. description), the rollout of a release is not carried over/inherited as part of a promote, and therefore, you need to explicitly set this if you don’t want the newly created release to be available to all of your users. This is the same parameter as the one described in the above section, and simply allows you to override the target binary version that will be used for the promoted release. If unspecified, the new release will inherit the target binary version property from the release being promoted. code-push promote MyApp-iOS Staging Production -t "*"
If you ran the rollback command on that deployment, a new release (v4) would be created that included the contents of the v2 release. End-users that had already acquired v3 would now be “moved back” to v2 when the app performs an update check. Additionally, any users that were still running v2, and therefore, had never acquired v3, wouldn’t receive an update since they are already running the latest release (this is why our update check uses the package hash in addition to the release label). NOTE: The release produced by a rollback will be annotated in the output of the deployment history command to help identify them more easily. The history will display all attributes about each release (e.g. label, mandatory) as well as indicate if any releases were made due to a promotion or a rollback operation. Additionally, the history displays the install metrics for each release. You can view the details about how to interpret the metric data in the documentation for the deployment ls command above. By default, the history doesn’t display the author of each release, but if you are collaborating on an app with other developers, and want to view who released each update, you can pass the additional --displayAuthor (or -a) flag to the history command. After running this command, client devices configured to receive updates using its associated deployment key will no longer receive the updates that have been cleared. This command is irreversible, and therefore should not be used in a production deployment.